The team, from the Universities of Manchester and Nottingham, used observations of the Big Bang and the curvature of space-time to accurately measure the mass of these elementary particles for the first time. The recent Planck spacecraft observations of the Cosmic Microwave Background (CMB) – the fading glow of the Big Bang – highlighted a discrepancy between these cosmological results and the predictions from other types of observations. The CMB is the oldest light in the Universe, and its study has allowed scientists to accurately measure cosmological parameters, such as the amount of matter in the Universe and its age. But an inconsistency arises when large-scale structures of the Universe, such as the distribution of galaxies, are observed. Professor Richard Battye, from The University of Manchester School of Physics and Astronomy, said: “We observe fewer galaxy clusters than we would expect from the Planck results and there is a weaker signal from gravitational lensing of galaxies than the CMB would suggest. 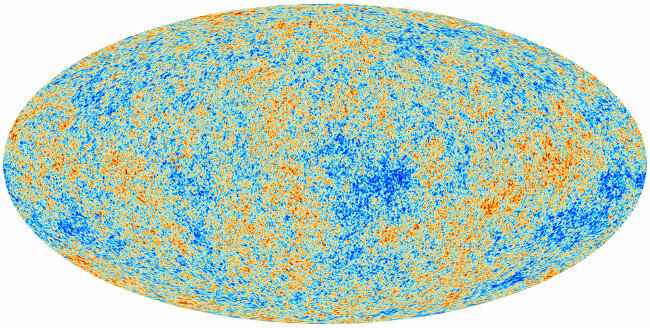 Map of the cosmic microwave background made by the European Space Agency’s Planck spacecraft. The results of this work on neutrinos were based in part on these observations. Credit: ESA, Low Frequency Instrument and High Frequency Instrument Consortia (2013). In this paper (published in Physical Review Letters on 7th February 2014), Professor Battye and co-author Dr Adam Moss, from the University of Nottingham, have combined the data from Planck with gravitational lensing observations in which images of galaxies are warped by the curvature of space-time. They conclude that the current discrepancies can be resolved if massive neutrinos are included in the standard cosmological model. They estimate that the sum of masses of neutrinos is 0.320 +/- 0.081 eV (assuming active neutrinos with three flavours). The paper is published in Physical Review Letters on 7th February and has been selected as an Editor’s choice. 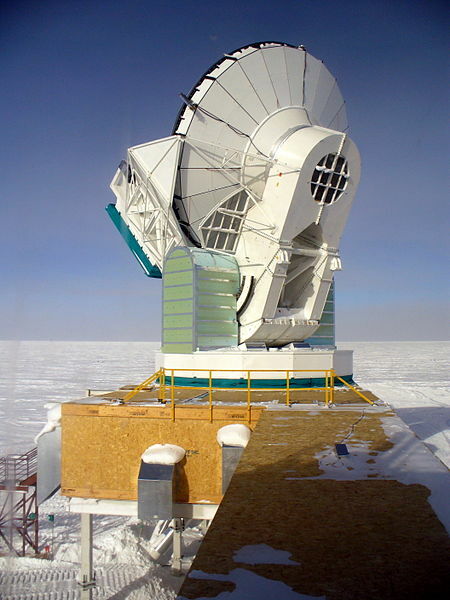 This paper makes use of CMB data from the European Space Agency’s Planck spacecraft and from the South Pole Telescope. The South Pole Telescope (SPT) is a 10 metre (394 in) diameter telescope located at the Amundsen-Scott South Pole Station, Antarctica. The telescope is designed for observations in the microwave, millimeter-wave, and submillimeter-wave regions of the electromagnetic spectrum, with the particular design goal of measuring the faint, diffuse emission from the Cosmic Microwave Background (CMB). The first major survey with the SPT–designed to find distant, massive, clusters of galaxies through their interaction with the CMB, with the goal of constraining the Dark Energy equation of state–was completed in October, 2011. In early 2012, a new camera was installed on the SPT with even greater sensitivity and the capability to measure the polarization of incoming light. This camera is designed to measure the so-called “B-mode” or “curl” component of the polarized CMB, leading to constraints on the mass of the neutrino and the energy scale of inflation. The SPT collaboration is made up of over a dozen (mostly North American) institutions, including the University of Chicago, the University of California-Berkeley, Case Western Reserve University, Harvard/Smithsonian Astrophysical Observatory, the University of Colorado-Boulder, McGill University, University of California at Davis, Ludwig Maximilian University of Munich, Argonne National Laboratory, and the National Institute for Standards and Technology. It is funded by the National Science Foundation. Jodrell Bank Centre for Astrophysics is directly involved with the two lowest frequencies of the Low Frequency Instrument on board Planck, the 30 and 44 GHz radiometers. These have four and six detectors respectively, operating at 20 Kelvin (-253.15 degrees Celsius). The resolution on the sky is 33 and 27 arc minutes, and the sensitivity 1.6 and 2.4 micro K (over 12 months). The cryogenic low noise amplifiers which are the heart of the radiometers were developed at Jodrell Bank, with help from the National Radio Astronomy Observatory in Virginia, USA. Dr B Maffei and Dr G Pisano are involved in the other focal instrument, the HFI. First at Cardiff University and then at The University of Manchester, they have played a major role in the design, development and calibration of the Focal Plane Unit, in particular the cold optics, in collaboration with the Institut d’Astrophysique Spatiale, France, Maynooth University, Ireland and JPL/Caltech, USA. The work to understand the Galactic emission seen by Planck is being co-led from Jodrell Bank by Emeritus Professor Rod Davies and Dr Clive Dickinson. A number of projects are led by Jodrell Bank scientists, including Professor Richard Davis and Dr Clive Dickinson. Each of the 14 projects focuses on one aspect of the Galaxy as seen by Planck, including the electrons that gyrate in the Galactic magnetic field, the ionized gas that pervades the interstellar medium and the dust grains that emit across the entire frequency range that Planck is sensitive to. Jodrell Bank is also leading the calibration and identifying systematics in the LFI data.